From water to spice, explore two of Goa’s most famous characteristics, the stunning Dudhsagar Waterfalls and an aromatic spice plantation. The Waterfalls and Spice tour allows holidaymakers to encounter two of Goa’s key attractions, the stunning Dudhsagar Waterfalls, among the highest in the whole of India, and an aromatic Goan spice plantation. The tour begins early in the morning where you will be collected you from your hotel and driven to Collem, for a hearty breakfast. Once you’re full up, your special four-wheel drive jeep will transport you to the heart of the Bhagwan Mahaveer Sanctuary passing through dense and verdant natural landscapes. After a short hike to the foot of the falls, you’ll have time to admire their splendour as well as the chance to take a dip in the water itself. 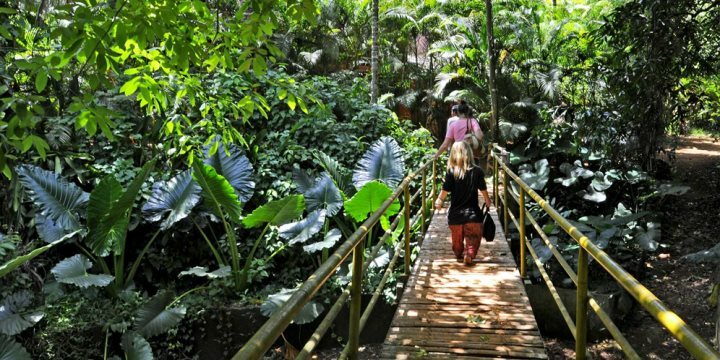 After leaving the falls, you'll head to a spice plantation where you'll enjoy a filling Goan lunch, and embark on a tour of the plantation. During the tour you'll explore the wonderful sights and aromas of a number of spices including nutmeg, cardamom, cinnamon and pepper, plus fruits such as bananas, pineapples, and much more.